The apartment is new and clean. It is in a great location, but it has some design and setup features that are very annoying and impractical. The two things that makes me not like the apartment can be easily addressed to make the stay of any guest pleasant: (1) the balcony door has no way to block the light, so the apartment gets bright very early. (2) The bathroom is a tub with a handheld shower with no way to put it in the wall and make it work as a shower (very impractical). The apartment isrun by a company (not an individual/owner) and one can notice the difference when dealing with staff vs. the owner. Some of the staff was very rigid and could not use context and logic when dealing with guests. It seems like they lack training or notion of customer service and satisfaction. They do not know they work in the hospitality business. At the end, after much aggravation, discussion and my having to get upset, they realized that my request was not illogical or rare and they accommodated me. It is a nice and centrally located apartment and it would take very little to make it a great apartment, if the owners want. This was a charming flat, nicely arranged and well equipped for two. The location was very good, not in a noisy congested area, but within easy walk or tram from a lot of central sights. The bed was great and we had all that we needed. The A/C was not working but the weather was cool enough that small fans worked to keep things pleasant. I would worry about staying in a hot period however, My only other issue was that the key chip really did not work well. It took both your representative and us several tries each time to get in the building. The last night we were there, I did not think it would ever work to get us in. That is not a good think to have to be out on the sidewalk with people trying to walk around you when the door does not open. A key code would be much better. Except for those two things we had a great stay. The staff was helpful. Your airport transfer service was great too. This apartment was awesome and the company was so easy to communicate with. 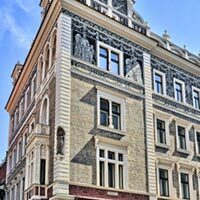 Wonderful location in Old Town Prague! Easy to walk to everything. Apartment was safe (with a chip reader to get into main entrance). Great amenities - had everything we needed and plenty of space for 2 people. Nice Bathroom, kitchen, comfortable bed and sitting area. Everyone we spoke to and emailed with at Prague City Apartments was very friendly and helpful. Perfect location for our 1 week stay. I would like to show my appreciation for all your good work during my stay at your apartment 3.1 on Jilska 2. I felt very comfortable and also rest assured that anything that might come up would be duly and efficiently handled by you whenever itwas needed, as it was the case in a number of occasions. Your assistance really helped to make my 10 weeks stay in Prague very much enjoyable and worry free. Overall, we loved the location. Our day in Prague started the moment we stepped out from the door. The building itself was beautiful. The staff were very friendly and even offered an excellent bottle of champagne on our arrival for our honeymoon which made it very special. Aside from this, the gift for Christmas was very thoughtful from the GM and staff. The apartment had the facilities for us to cook and do laundry which was exactly what we needed in our trip and all facilities were in good working condition. The downsides were that we had to check in at a separate building. Albeit 3 minutes away, the cobblestones and approx 50kg of luggage made the journey challenging to say the least; we intentionally arranged transport directto the jilska apartments to minimize travelling with the luggage. Regardless, upon check-in the staff walked us to the apartment. At the price, we expected a better bed instead of 2 single mattresses stuck together. Got abit in the way but was still comfortable and clean. Aside from these 2 downsides, we really enjoyed our stay and would still highly recommend the place!